The New Zealand Defence Force (NZDF) has delivered about two tonnes of voting equipment to the Solomon Islands for the South Pacific countrys national and provincial elections this year. 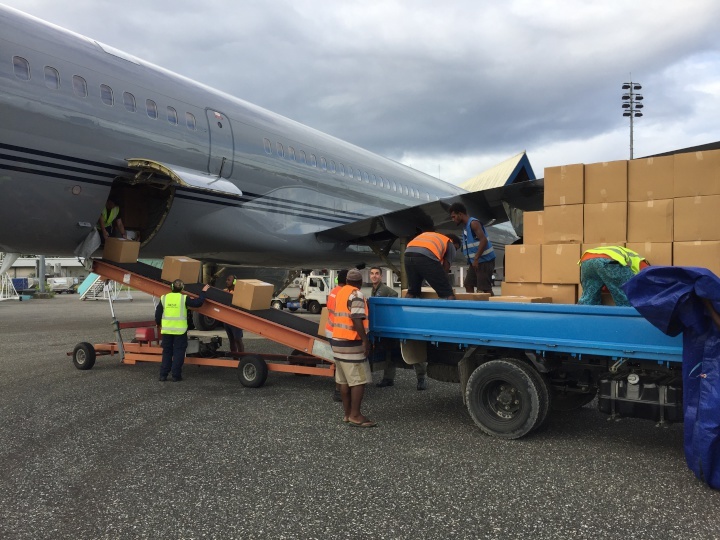 Flight Lieutenant Sam Hatrick, aircraft captain from the Royal New Zealand Air Force’s No.40 Squadron, helps offload about two tonnes of voting equipment and operational supplies for The Fred Hollows Foundation New Zealand from an RNZAF Boeing 757 aircraft at Honiara yesterday. The New Zealand Defence Force (NZDF) has delivered about two tonnes of voting equipment to the Solomon Islands for the South Pacific country’s national and provincial elections this year. Air Commodore Tim Walshe, the Air Component Commander, said the Ministry of Foreign Affairs and Trade was providing the voting screens to the Solomon Islands Electoral Commission. “New Zealand, together with our Pacific partners, contributed to restoring peace and stability in the Solomon Islands in the early 2000s,” Air Commodore Walshe said. Flight Lieutenant Sam Hatrick, aircraft captain from the Royal New Zealand Air Force’s No.40 Squadron, said an RNZAF Boeing 757 aircraft on a scheduled flight to the Pacific flew to Honiara to deliver the voting equipment, as well as operational supplies for The Fred Hollows Foundation New Zealand, a non-governmental organisation working in the Pacific to treat and prevent blindness. The Foundation’s Regional Eye Centre in Honiara would use the supplies to deliver eye care services to communities across the country, Engagement Director Margi Mellsop said.